So reads the opening exposition of this, the Mad Max series of the Fury Road tie-ins. An elderly man is telling the tale of Max to his fellow villagers, settlers of the remnants of Immortan Joe’s cliff headquarters. During this exposition scenes are shown from the previous three Mad Max movies. We see Max’s family run down by Toecutter’s biker gang, Lord Humongous, the rulers of Bartertown and a glimpse into the Thunderdome, which will play into the story later. We even see a glimpse of the tribe of children out in the desert, which is all we need to see. This opening exposition is a reminder that this series has a lot to live up to, and so far it’s hard to say if it will. This is a pretty good issue, but I get the feeling that the storytelling going forward may be compromised by the need to push the new movie. I’ve been pointing out in my Star Wars comic reviews the need to shoehorn references to the movies into these adaptations, which at times can be fun but sometimes just comes off as fan service to fill in space. I did like the sequence in the Thunderdome of Gastown, which offers an interesting look into the almost religious element of the competition to the hopeless souls of this ravaged future. More references to the cut and paste religions of this apocalyptic future offer some interesting shading to this world. George Miller gets a ‘Story’ credit for this issue, which means he may have just pitched the general idea to Mark Sexton and Nico Lathouris, who have script credits. Miller’s stamp is definitely in the plot, as there are trademarks of the Mad Max series in here that I appreciate a lot, like the fact that Max is basically a folk hero to these people, a wanderer of the desert who roams into the different towns looking for auto parts for his Interceptor. Typically he instead ends up righting wrongs and freeing the disenfranchised inhabitants of the town. 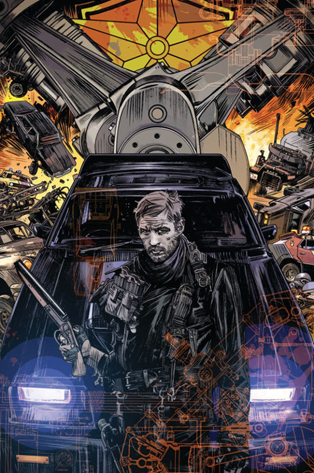 Max starts the issue out rolling into Gastown, the massive spot of hell that we get a glimpse of in Fury Road. Gastown is just as hellish on the inside, and Max is basically just passing through to compete in the Thunderdome as part of the Amnesty, where the prize is a new V8 car engine. He manages to win, with the help of a mysterious woman in the crowd. We get to see more of the Buzzards, the spiky armored tribe of scavengers from Fury Road. They try to kill Max at the end of this issue in exchange for him murdering their leader, but Max is again rescued by the mystery woman, who is looking for a favor from Max. Could this be what ultimately leads Max to Immortan Joe, or some completely different adventure? It’s interesting to note that these are the first original comic book stories taking place in the Mad Max universe. While it seems like there’s a lot that could be done with this format (Fury Road was practically a live action comic book, and oh so awesome), it seems like this story must be tethered to story points established in Fury Road. What exists beyond the three towns in the movie? Is it canon that the story now takes place after Beyond Thunderdome? I read in an interview that Miller said that this movie takes place in between the first and second movies. Not that any of this matters, but if anything it would explain why Max is a wooly mess at the beginning of the movie when he is abducted by the War Boys, where in this comic he’s more groomed. What is the connection to Fury Road? Ultimately I don’t know if I want more of the Mad Max universe explained in great detail to me. What’s so great about Fury Road is that we receive an overload of characters and visuals that are open to interpretation and our imaginations. I love the mythical qualities of this series, and the vagueness as to whether Max is a real person or a hero from the wastelands here to rescue the people. If anything, I hope that we are introduced to more new characters and places in this apocalyptic world. It’s too early to say, but hopefully going forward this comic will follow the excellent example of The Road Warrior and Fury Road and show more than tell. One word: Lobot. Once I saw that Lando’s assistant with cybernetic male pattern baldness play a prominent role in this first issue I was sold on this series. From a comic taking place in an unfortunate future to one that takes place a long time ago in a galaxy far, far away, Lando is just what I needed after reading the Fury Road comic. In one issue Charles Soule manages to really capture the fun essence of the smoothest operator in the Star Wars universe. There is no time wasted in this comic as Lando steals a potentially debt-clearing MacGuffin from an Imperial governor and then is on another quest in a heartbeat, a quest that has been brought to the attention of Emperor Palpatine himself. Charles Soule does it again! 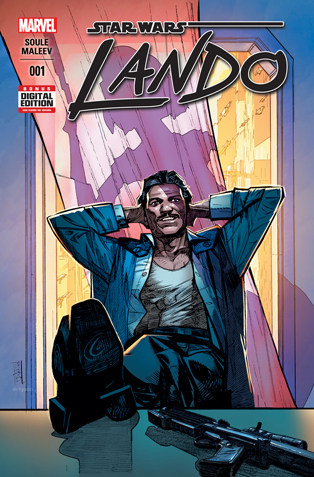 I have enjoyed pretty much everything he’s written, and this first issue of Lando is no exception. One thing that’s nice about the issue is how much of it feels new. More and more I find that comic books taking place in an adapted universe should make use of the universe to create new characters and situations. While a little familiarity is nice a comic book should be grounds for exploring as much as you can without the limitations of budget. In Lando that means aliens, seedy dives, high rise penthouses and space ships galore. This is Star Wars operating outside of its genre comfort zone, and I’m loving it. More noir, heist capers and humor in my science fiction cocktail please. Alex Maleev portrays the numerous locations in this book wonderfully, and alternates from tight and tense situations taking place in crowded rooms and offices for scenes involving Lando’s shady wheelings and dealings to outer space, spacious apartments and throne rooms for action involving the rich and wealthy. In other words, the Imperials. What is established right of the bat is that Lando Calrissian operates in both of these worlds with ease, despite making some mistakes that get him into more trouble. What makes me excited about this series is that Lando truly is a wild card. We know little about his past other than his shared history with Han Solo, his tenure as Baron Administrator of Cloud City, and his “little maneuver at the Battle of Tanaab”, which gained him a promotion to General Calrissian in Return of the Jedi. As a result that allows for a lot of storytelling flexibility and potentially opens the door to new places in the Star Wars universe. Obviously we’ll probably see Han and Chewie in this series, but other than that there’s plenty of places that are new to us for Lando to go to before he swindles his way into running Cloud City. As far as fun Star Wars characters go Lando is at the top of the list, and the humor in addition to the action is a nice change of place in the sometime too operatic space opera of this franchise. On top of that we also get to know Lobot a little better, which potentially means that a Lobot solo adventure may be in the future of this series, something that I wholeheartedly approve. While the track record of the Star Wars comics has been excellent, Lando is a refreshing break from Luke and company, for now. It’s great to see the man before all the crazy stuff with The Empire went down. I’m on board, and looking forward to potentially getting to see the Battle of Tanaab!